Posted 10/8/2015 12:39pm by Ben Wenk. In the past, you have (or maybe haven't) read me blogging about in depth growing practices, answering your questions from the interwebs, and creating content to address some of our most frequently asked questions at market. All these have been fun "blog series" to write if you want to call them such a thing but I hadn't come up with the next thing to write about until today when I was tasked with judging the maturity to harvest of about 6 different apple varieties. I took to Instagram to nerd out when I realized, hey! This might make for a fun read! And when you're as nerdy as I am with... well... everything, then you're pretty much of the opinion that there's a large population of folks eager to nerd out with you. So, in blatant denial of the truth - that being, of course, that you couldn't be any less interested, I introduce the new blog series, Nerdy Ag. So! Apple trees exhibit two kinds of growth: vegetative and propagative. While that statement alone warrants another blog entry unto itself, we'll concern ourselves only of the propagative growth which is how we get fruit - that is to say vegetative growth makes limbs and leaves, propagative gives us fruit. We'll talk about buds and biennial trees later. A pollinated blossom forms a tiny fruitlet that undergoes rapid cell division. After "June drop" these apples start to grow by cell division and finally, begin to convert starches to sugars. There are many ways to tell if an apple is "mature" or ripe - some sensory, some scientific. The first indicator is seed color. The apple (matured ovary, nerds) isn't making it's final maturing stages until the seeds have gone from a green color to a darker, browner color. If you cut open an apple and see green seeds, you need test anything else - you're looking at a "green" (immature, unripe) fruit. A second test for apples that have mature seeds is a starch-iodine test. Again, apples that are cut and tested are immediately discarded, so let not your heart be troubled. To perform a starch iodine test, you'll need to cut the apple horizontally and use a garden spritzer to apple an iodine solution. When the Iodine reacts with the flesh of the apple, you can determine what percentage of starches have been converted to sugars. 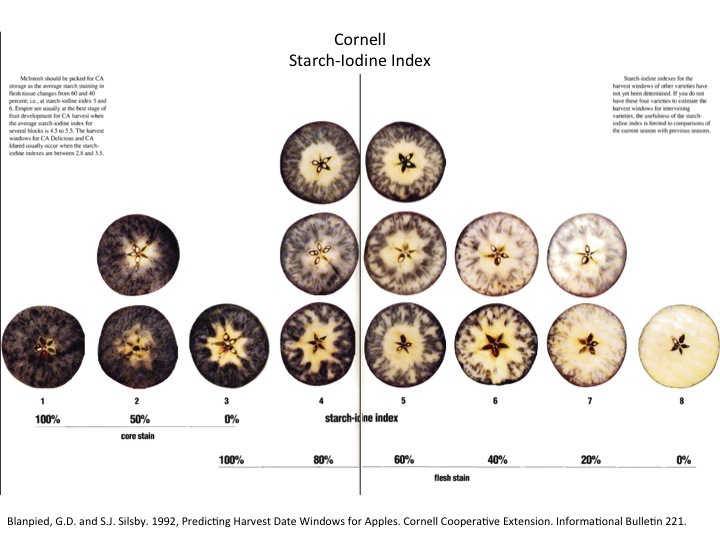 Because this starch conversion to sugars continue post harvest, it's important to consult charts like this to determine when to harvest (see also 8 index chart). A third test, popular in the processing apple industry, is using a penetrometer. As the name implies, this tests the firmness of the apple by the resistance pressure made by the cells of the apples flesh! A reading of the pressure at the time of delivery of apples to a processor is an important metric in deciding what products can/should be made with them. Fancy penetrometers are for inside, lab use only and sit on a table to remove all other variables. Hand held penetrometers are more common, as they are easy to take to the field with you, though steps must be made to insure the accuracy of measurements. This final, fourth mention of the term "penetrometer" is merely to see if there's still anyone out there with a middle school sense of humor who hasn't giggled. But the fun and easy one that I use the most is the refractometer (pictured). This measures the brix, the amount of sugar, in a suspended solution, of which apple juice (cider) is one. We'll talk sensory tests later, but as one who is somewhat sensory deficient, this is my method of choice. Testing is done by squeezing the juice of an apple onto the pen-like tip of this kaleidoscope measuring device. Once you flatten this solution into a thin, uniform film, you can point the refractometer at the light and see the reading as you look into the eyepiece. Let's get this gadget working! Let's start with a low brix reading. Please consider the Braeburn apple pictured to the right, here. As you can tell from the photo - my iPhone camera lens through the eyepiece of the refractometer, this apple is measuring only 12 brix (bx). To taste this apple, you'd agree - underripe. And, true to form, this would be about 10-15 days earlier than we'd ever harvested Braeburn otherwise. But! As you'll also see form the picture, it looks like a ready-to-eat apple! I'm colorblind, so I'm making myself learn fruit maturity the scientific way and this is a situation in which it's really helpful. However, I'm also blessed with a discerning palette and it wasn't hard for anyone to find this apple green, starchy, and unsweet to taste it. Let's move on - I only tested this one because I was driving by it on the way to other fruits! These next two varieties had different brix but were both deemed to be ready for harvest. The first was a slam dunk. It's only the second harvest for these here at Three Springs but they're quickly becoming one of my favorites - Pink Lady cv. 'Maslin', an early ripening mutuation of Pink Lady cv. 'Cripps Pink'. As you can see in the photo, these chimed in at a brix over 15 which is really great! Most importantly, they tasted like they were ready. As did the Cameo, pictured on the right. Long a favorite here around the farm for their flavor, crunch, and storability. This is an apple we typically sell straight through March, April, and May so at a few fewer brix, these will be harvested at a maturity that will 1) taste good now, right off the tree and 2) have some starches that can convert to sugar in a storage scenario such that the fruit continues to mature and sweeten in storage, rather than spoil. The next apple I tested is one we get a lot of questions about in the fall: Stayman. Without going into the differences between Stayman, Winesap, and Stayman/Winesap (this is the first of these) - 'Snapp' Stayman for the real hort nerds out there was an apple that measured high in brix but I didn't think was quite ready. We were hoping to harvest these with the likes of Cameo and Pink Lady 'Maslin' from a logistics/efficiency/management perspective. However, while the instruments put Stayman on par with 'Maslin' Pink Lady - it still tasted starchy to me. I just think this one needs a little more time. From a logistics standpoint, the next chance we would have to harvest it would be the following week at the same time, but I think that'll be worth the wait based 100% on my own sensory evaluation. The final case we'll look at is the same apple in two different areas of our same farm. We'll call this variety Mystery Apple (to torture you) and we'll call the first location X, and the second Y (he said quite nerdishly). Mystery Apple, location X is on a semi-dwarfing disease resistant rootstock - G.16. These are planted between an existing block of Honeycrisp on m.26 (also semi dwarf) and a windbreak beside a little brook. What this means is shading - significantly less sun than site Y. It is, however, lower elevation and a consistently warmer site than site Y and the rootstock more dwarfing. Trees on site X are also significantly younger than Y, less mature. While I have witnessed more dwarfing (read, more light inception) and young (smaller) trees produce higher quality fruit, these apples at site X, while a little inconclusive if you look at that shot, were, at best about a 14-15 bx. Meanwhile, older more mature trees, on a more vigorous rootstock, at a higher elevation (colder) site (Y) produced mystery apples with a brix of 21! I'll keep an eye on these two blocks going forward but Mystery apple harvested last year at a brix of 24 and since this year was a little more mild, heat-wise, I'll call these ready to harvest at 21 for 2015. But this is just a cool, nerdy, scientific horticultural wonder to keep an eye on as these two blocks mature. Block Y will be less light inception per tree in full sun. Block X will be more light inception at a half-day's sun. Which will produce better quality (higher brix) Mystery apples. It's science - that's what makes these mysteries fun! This nerdy blog references penetrometers and starch-iodine tests! See video below from PA Apples for MORE nerdy content including videos of both nerdy instruments in action! Note, that bench penetrometer will be much more accurate than our hand-held penetrometer!